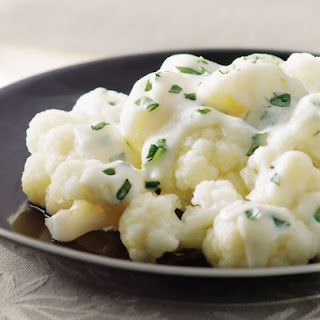 Plain steamed or microwaved cauliflower turns into something extraordinary when you cover it with this rich-tasting twist on a classic cheese sauce. 2. Meanwhile, whisk flour with 2 tablespoons milk until smooth. Heat the remaining milk in a saucepan over medium heat until steaming. Add the flour mixture; cook, whisking, until the sauce bubbles and thickens, 2 to 3 minutes. 3. Remove from heat; stir in Gruyere, chives (or parsley), garlic, salt and pepper. Spoon over the cauliflower and serve.